There’s more to the laminated top than first meets the eye. 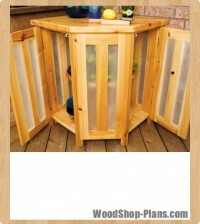 Steel rods hidden inside prevent the top strips of wood from cupping and separating. The first step involves slicing your strips from planks planed to 2″ thick. The width of each top strip isn’t important so long as the top totals 20″ wide. Make sure the front and back edge strips are at least 1 1/2″ wide so there’s room to bore pockets for the washers and nuts that secure the ends of the threaded rods. I used a combination of 2″-, 1 1/2″-, and 1″-wide strips, assembled in random order. Rough-cut the strips 1″ longer than the materials list specifies so you can trim the top square after gluing. Drill 1″-deep pockets into the outside strips with a 1″-dia. Forstner or spade bit. Then switch to a 1/2″-dia. bit to bore oversized holes through all the top strips for the steel rods. Ensure consistent alignment by using the first one as a template, and drill the remaining strips one at a time. The top of the block will get wet so use a water-resistant glue, such as Type II PVA or a polyurethane adhesive, when assembling the top. Install the threaded rods while the glue cures overnight. Tighten all the joints with bar clamps. Remove excess glue around the joints with a scraper and smooth the top and bottom faces with a belt sander. Run across the grain, constantly moving the sander. Trim the top with a circular saw along a straightedge. Next come the tongue-and-groove joints connecting the end caps to the top. These caps hide the end grain and prevent the top from cupping. Mill the 1/2″-long x 1″-thick tongues with a straightedge and a handheld router spinning a 1/2″ straight bit. Make end caps to fit. Don’t use glue to fasten the end caps to the top because the joint’s cross-grain stops the top from moving laterally as it expands and contracts. Instead, use four #8 x 1 1/2″ screws to attach each end piece. Countersink the screws into 3/8″-dia. pockets for tapered wooden plugs. Create an oval hole for the screw by rocking the drill bit from side to side as you bore. The oval hole allows for some tabletop movement. Cut 1″ dia. x 1″-long maple dowel plugs to cover the threaded rods, but don’t glue yet. By relying on a friction fit for the first few months, you can still remove the dowel plugs and tighten the nuts if the top eventually shrinks. Begin by cutting the skirts, crossbraces, and legs. If you laminate the leg blanks together from narrower stock, rotate the legs so that the joints face the outside. This is stronger and looks better. The crossbraces attach to the legs with ebony-wedged tenons that extend through mortises in the legs. Start by marking the mortise positions on the legs. Centre the brace mortises across the width of the legs and offset the skirts 1/4″on the outside faces. Drill a series of 1/2″-dia. overlapping holes to form the mortise openings. Set the drill press depth gauge just shy of the bottom and finish drilling from the other side to prevent tearout. Clean up the mortise openings with a chisel. Now prepare the matching tenons. Make the skirt tenons 1/16″ shorter than the mortise depth so the shoulders completely contact the legs. The brace tenons should be 1/16″ longer than the thickness of the legs and extend slightly proud of the surface. Sand flush after the joints are assembled and wedged. I cut the tenons with a tablesaw, starting with four cuts to define the shoulders. Continue by sawing the waste from the tenon cheeks, leaving them slightly thicker than needed. Finish up by paring material from the cheeks with a sharp chisel to create a snug fit within each mortise. If you make the shoulder cuts 1/32″ deeper than required, it will be easier to remove material from the corners when you chisel. Complete the tenons by cutting notches for the hardwood wedges. Drill a 1/8″ hole at the end of each notch so the wood doesn’t split when the wedges are taped into place. Dry fit the base together and if everything looks good dismantle, glue the joints and reassemble with clamps. Before setting aside to dry, glue the wedges in place and check to make sure everything’s square. Once the glue dries, sand the ends of the brace tenons flush with the legs. Next come the nine shelf slats for the lower shelf and the two rack slats. Trim the ends 45°, then cut 3/4″-deep notches to fit over the braces. The wine rack slats should be easy to remove so make these notches 1/16″ wider than the others. Install the shelf slats with glue and #8 x 1 1/4″ screws. Counter-bore into 3/8″-dia. holes for tapered plugs. Attach the top with metal clips fit into slots cut in the skirt sides using a biscuit joiner. The slots allow the top to move freely as it expands and contracts, while the metal clips hold it firm. Don’t rely on the drawer dimensions given in the plans-for a precise fit, measure the opening and allow for a 1/16″ clearance on each side and 1/4″ recess at the front. Join the sides to the drawer face with half-blind dovetails and the back corners with rabbets. Any strong joint should work so long as the dimensions are correct. Prepare the corner joints, then cut 1/4″ grooves into the sides and front for the plywood bottom panel. 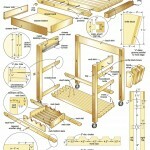 You may want to rout the recess before assembling the drawer, in case of error. 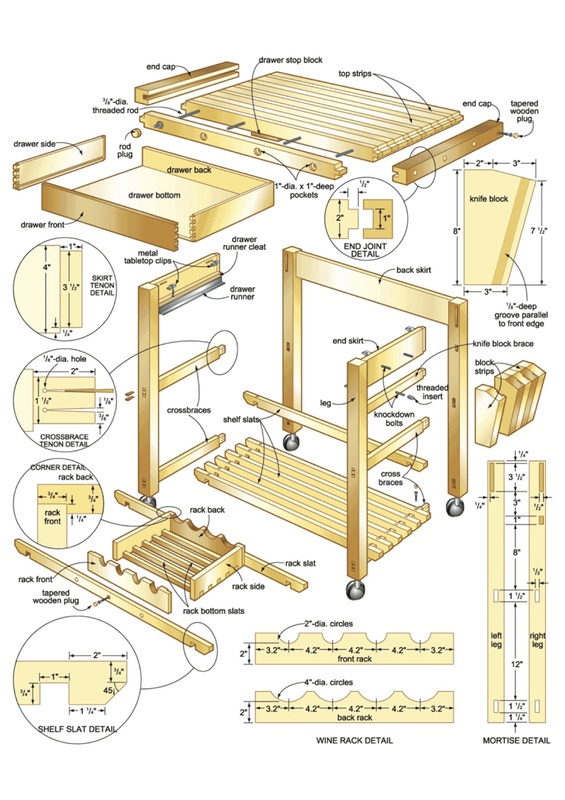 Assemble the drawer with glue and clamps. Cut the bottom to size and slide into place from the back. Tap in a few finishing nails to connect the back edge to the box. The drawer glides along a pair of L-shaped aluminum tracks screwed to the wooden drawer runner cleats. These cleats shim the aluminum flush with the inside face of the legs. Attach the runners to the spacers with #8 x 3/4″ screws. Counterbore slightly below the surface. Make the knife block from several layers of wood laminated together. Cut a 5″ x 8″ blank for each layer, then taper the top and front edges of each. Cut knife slots parallel to the front edges with a dado blade set 1/8″-deep. Glue the block together with clamps and waterproof adhesive. Sand the knife block after the glue dries. 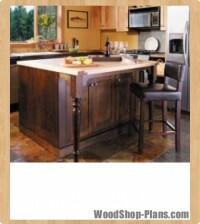 Fasten the knife block to the island, using knockdown hardware so it can be easily removed for cleaning or repair. Knockdown hardware consists of bolts with wide, flat heads and metal inserts with threads cut on both the inside and outside faces. The exterior threads sink into the wood during installation, anchoring the insert solidly. The internal threads accept bolts. Clamp the block to the island and drill small pilot holes for the bolts. 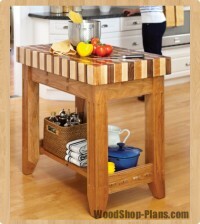 Remove the knife block and widen the island holes with a 1/4″-dia. bit. Expand the holes with a 1 1/32″-dia. bit for the threaded inserts. Install the nuts and attach the knife block. First cut the sides, front and back pieces. Then, using a compass, mark the curved edges for wine bottles. Cut the openings and sand the edges. Roundover the parts with a 3/8″-rad. bit in a table-mounted router. Next, rabbet the corner joints and cut notches for the bottom slats. Cut the slats 1/16″ longer than the dimensions for sanding. Glue and clamp the rack together and set it aside to dry. Later, install the wine rack between the two rack stretchers with glue and counterbored #8 x 1 1/4″ screws. Remove the top, knife block, drawer and wine rack before finishing. 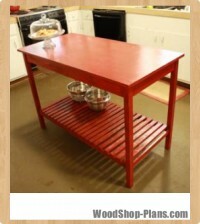 Apply three coats of polyurethane to the base and two coats of 100 per cent pure tung oil on the top. Make sure the finish is safe for contact with food. Some tung oils have dangerous polymers and other additives. Pure tung oil is food safe. Leaving the top unfinished is an option, too. According to a University of Wisconsin-Madison study, bare wood surfaces killed 99.9% of typical food-borne bacteria placed on it within three minutes, even without washing. Plastic or fully-sealed wood surfaces were shown to harbour bacteria for much longer. Even a thorough washing in hot, soapy water failed to kill all harmful bacteria. 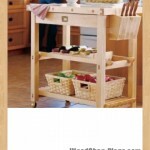 Reassemble the island and add heavy-duty casters to the legs. Make sure the casters can support at least 50 lbs. each. Before installing the drawer, rub some candle wax onto the runners to prevent binding. 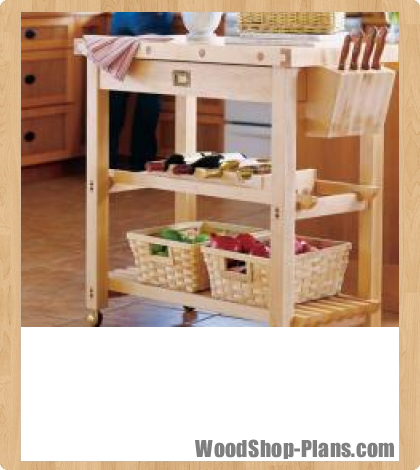 Reapply periodically to keep the drawer sliding smoothly. Add a cleat underneath the top to stop the drawer from pulling out too far.